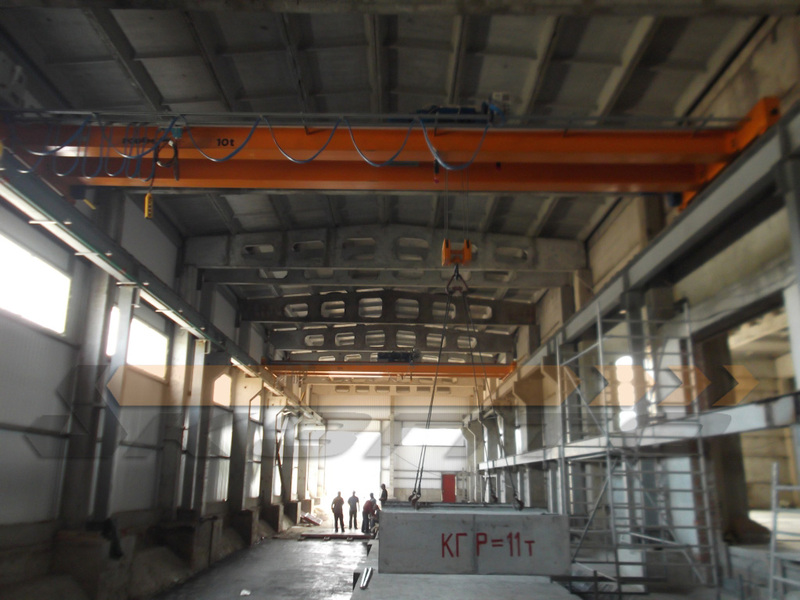 For the plant of reinforced concrete products by «Kyiv Crane Machinery Plant LLC» were delivered to overhead cranes lifting capacity of 10.0 tons. In double-girder design with the ability to work in tandem mode. 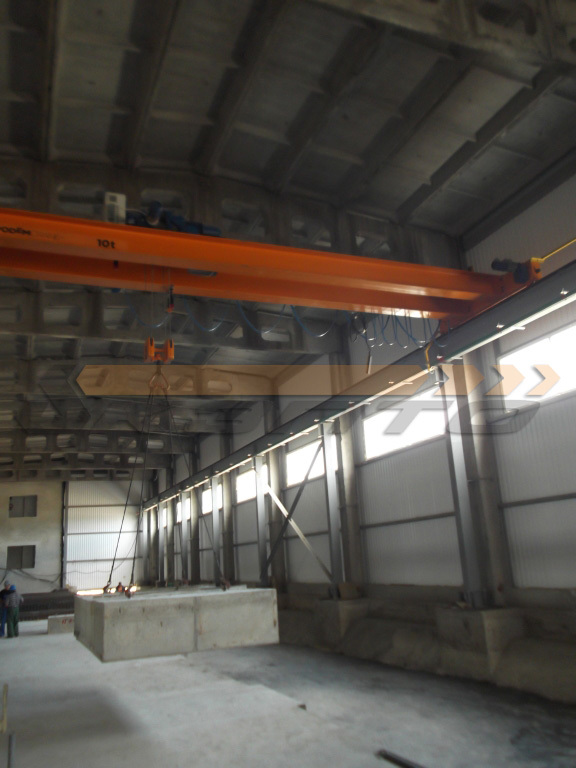 Bridge cranes g/n 10,0t have a span of 10,5m. 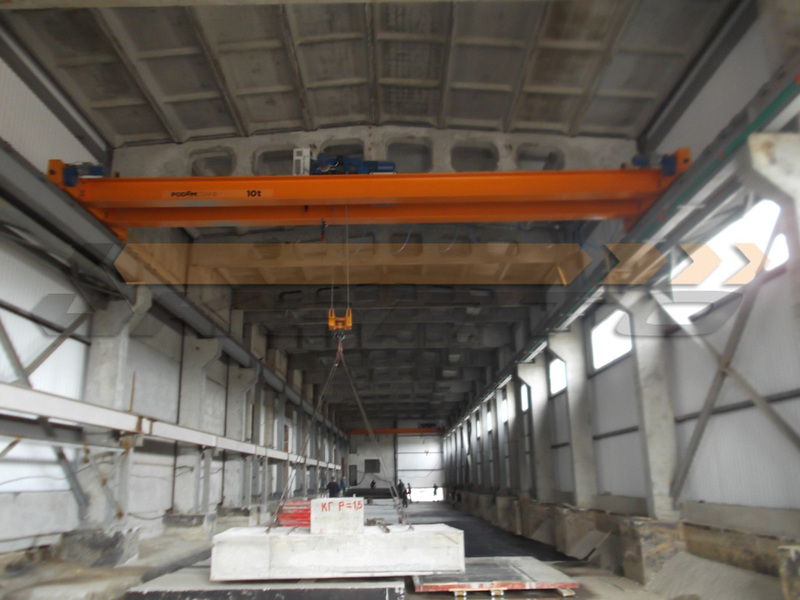 Given the design features of the workshop it was decided to establish a double-girder cranes. 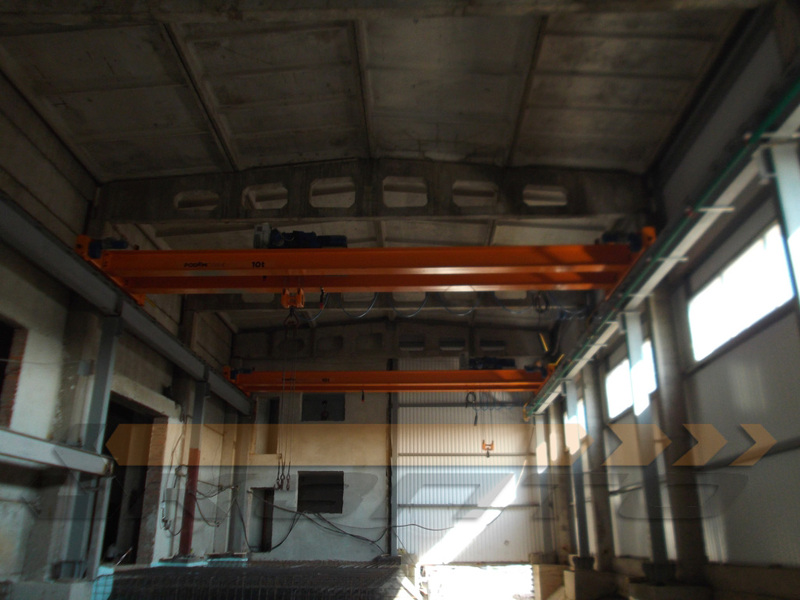 This version allows you to set the trolley on the crane girder span, rather than hang hoist under a beam in single-beam design. This allows you to win and raise the building height hook to the most upper position. 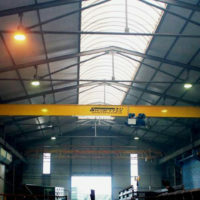 The design span beams were used beams type HEA, Frankstahl (Germany). 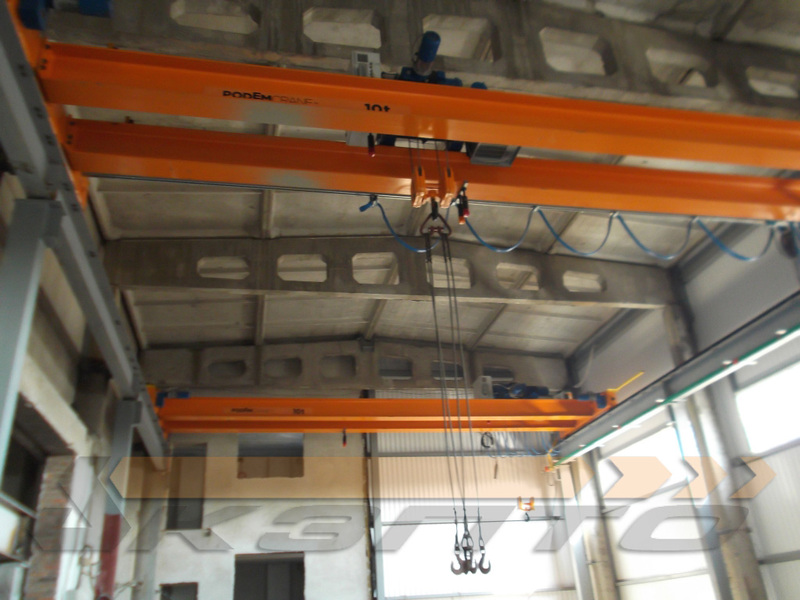 Lifting mechanism - Truck crane type 53 MT 525 H7 V1 4/1 MED20 / 6,5, travel gear - the type of end carriages G2250-3700-V1. All major components of production Podem, Bulgaria. 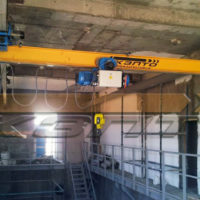 The cranes are equipped with radio remote control system TeleCrane. Electric valves and control system allows to operate the valves in the "tandem" mode. Pulling the operator selects "Crane - 1", "Crane - 2" or "tap-tap-1 + 2" in tandem. 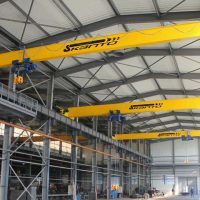 This solution enables the lifting operations in different parts of the shop independently, or move large structure with two cranes simultaneously. 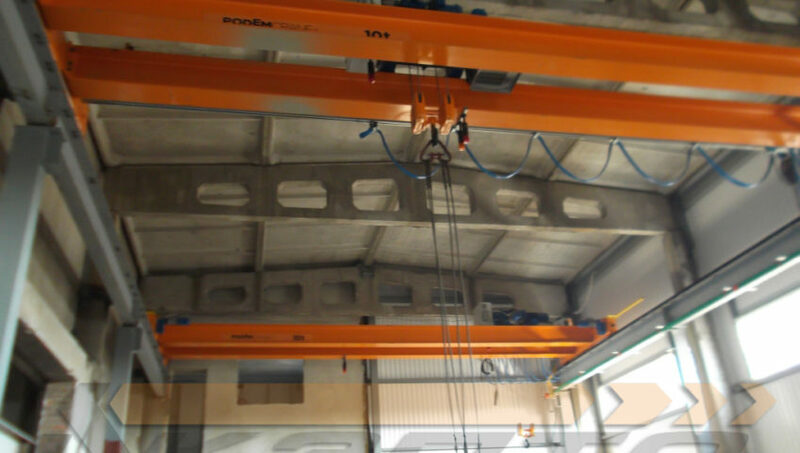 All lifting and moving mechanisms of cranes installed variable speed drive Schneider Electric (Altivar type). 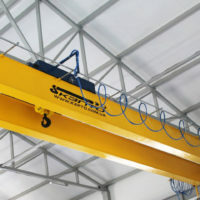 Power management enables the crane along the trolley current lead gated, food carts crane - mains connection cable to the hard metal sections such as Festoon. 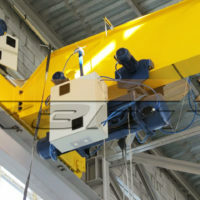 On cranes installed additional security from the collision - the limit switches are triggered when approaching cranes. At the approach of less than 3 m - 1 is activated limit switch position with the transition to a lower movement speed at the approach of less than 1m - works 2 position limit switch on and off the movement of the two cranes. Cranes have been static and dynamic testing and were put into operation.